"Designers are especially susceptible to [the delusion that technology can, more often than not, provide the solution], perhaps because they are trained to solve the immediate rather than long-term problems. 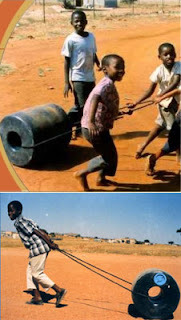 By way of example, inventions like the ... Q-Drum water rollers work well at alleviating hard work over level ground, but are less effective than a jerrycan headload over meandering, hilly, narrow footpaths." The article explores other examples and failings of many appropriate designs, and a pattern seems to be that these designs are more tailored to elicit praise from the design community itself than to truly solve the real and whole problems that exist in the field. This is an excellent point, overall - and one that I regret that this blog and its readers must beware! Your humble author is not in the intended field of use in many cases, does not witness the whole scenarios in which these products exist, and therefore often cannot distinguish when a design is merely buzzworthy or truly effective. Logical analysis is used as much as possible, of course, but even then there are limits. Then again, I hope and believe that this kind of critical thought and analysis is the whole idea of this blog. Whether or not these things can all be figured out, if you're reading it, hopefully you're having fun trying it. Just like that Q-Drum can work in some situations and not as well in others, it's worth a try!